Kfoury E, Leng D, Hashemi H and Mukherjee D. Cardiac Morbidity of Carotid Endarterectomy Using Regional Anesthesia Is Similar to Carotid Stent Angioplasty. 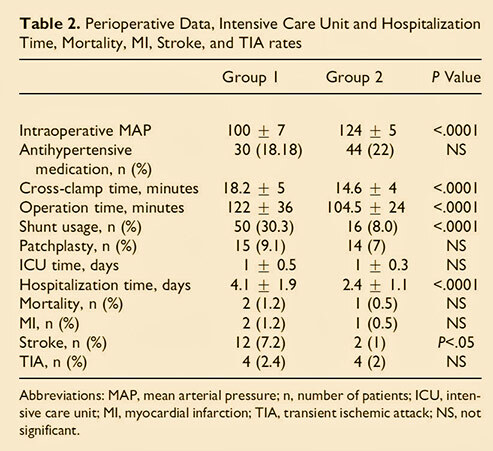 Vasc Endovascular Surg 2013;47: 599-602. Harbaugh RE, Patel A. Surgical Advances for Extracranial Carotid Stenosis. Neurosurgery 2014; 74: S83-91. Gürer O, Yapici F, Yapici N, Özler A, and Isik Ö. Comparison Between Local and General Anesthesia for Carotid Endarterectomy: Early and Late Results. Vasc Endovascular Surg 2012; 46: 131-138.